If you thought Lance Armstrong’s doping scandal would be the last controversy to rock the world of professional cycling — you were wrong. In the latest reports of ongoing corruption in pro cycling, the international governing body Union Cyclist International confirmed that a 19-year-old rider Femke Van den Driessche cheated in the World Championships using a small motor to power the rear wheel. The revelation is part of a growing problem in professional cycling that forced the UCI to add a clause to the rulebook about “technological doping” early last year. The report somewhat shocking given the nature of cheating scandals in major sports: Historically, some of the most well-known cheating scandals have been socially engineered like paying referees or using performance-enhancing drugs. The reason that the UCI revelation was so big was that it marks the first time a cheater in a sport competition has been caught using motorised technology to receive an unfair advantage. There are two common ways a person can install a motor into a bicycle: one way is to use a throttle, or a little lever on the handlebar that makes the motor run. When you push the button or twist the throttle, the motor speed increases, and the bike accelerates. The downside to this methods is that the throttle is visible, so if you’re trying to use the bike to cheat in a professional cycling competition, this type isn’t an option. The other way to install a motor on a bicycle is by using a cadence sensor or torque sensor. These methods work a lot like a throttle, but rather than regulating the power by pressing a button, you actually control it with your feet. The sensor is placed by your pedals, and it’s able to detect the speed of your pedal movement typically by monitoring a small magnet that passes by the sensor with every turn of the pedal. The motor runs at a higher speed when the pedals are going faster. These types of kits often referred to as pedal-assist bicycles because the speed of the motor is entirely controlled by the rotation of the bike’s pedals. Cheaters using electric motors in professional competitions prefer pedal-assist bicycles to ones with throttles because it’s much harder to detect the illegal motor at first glance. There are also a lot of options when it comes to installing a pedal-assist motor into a racing bicycle. There are literally dozens of other popular electric bike motors on the market. 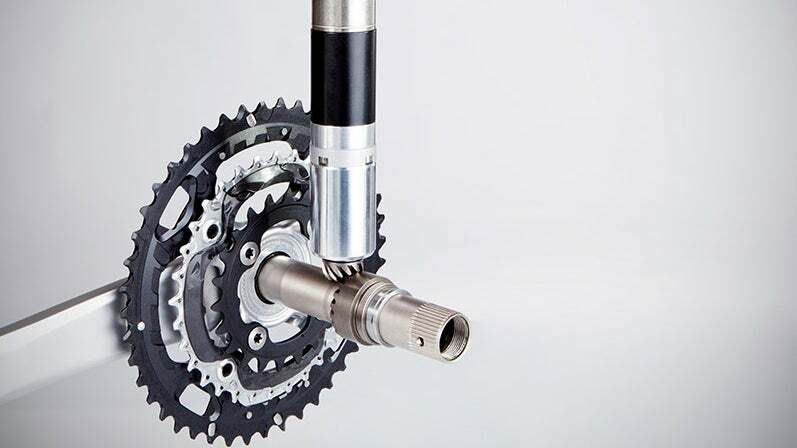 Although they’re not specifically being marketed as tools for cheaters, the shrinking size of the motors as well as the ease of installation makes them very tempting for riders who lack moral fortitude. We’re now reaching a boiling point where the technologically is finally cheap enough for people to buy. How Does UCI Prevent The Use of Illegal Electric Motors? For several years, the UCI has used large, airport-style x-ray machines at the Tour de France to scan bicycles for illegal use of electric motors in competing bicycles. Last year, rider Chris Froome was accused of using a motor inside his bicycle during competition (in addition to the doping allegations that hung over his head). Accusers cited Froome’s unusual acceleration speeds as reason to believe that he was being propelled by an electronic motor. Froome applauded the bicycle checks that were levied against him and other racers because he felt like it would put an end to speculation about whether or not he cheated. The UCI reportedly caught Van den Driessche by using a computer that can read radio frequencies emitted by the motor. When the computer detected signs of a motor in Van den Driessche’s bicycle, the governing body reportedly removed the seat post and discovered wires sticking out. For now, the vetting process for all professional cyclists is still being put together by governing bodies. Just like any other areas technological innovation, the rules have not yet caught up to what’s possible. In the future, there are bound to be more powerful motors that require less battery power and can be hidden in just about any part of a bicycle. On the other hand, new methods of motor detection are likely to emerge. I’d expect to see many scanning technologies that are already being used in military settings and airports to be used in cycling competitions. Possible scanning technologies include thermal scanning, listening for radio frequencies, and millimetre wave scanning.